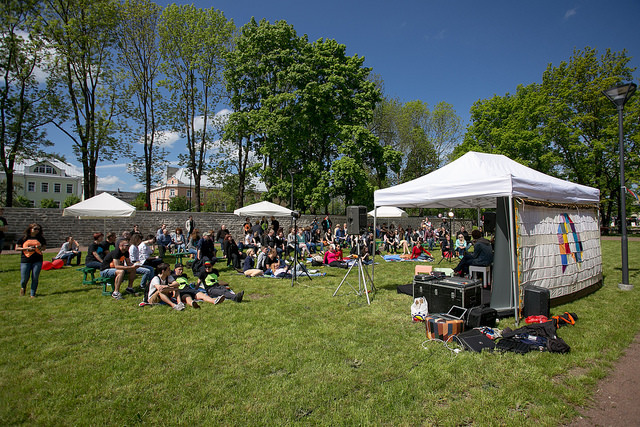 Hundreds of people gathered today in Narva to discuss issues as diverse as the role of social criticism in music to Russian schools in Estonia and the relevance of civil activity – this was the first pre-festival that acts as a prequel to the real Festival of Opinion Culture to be held in Paide in August. “We’re pleased that the pre-festival event was eventful and successful, as was evident in the local community’s serious interest to participate in discussions about the region’s future. We remain hopeful that the discussions that got started here will continue in Paide in August,” said the festival’s theme areas leader Maiu Uus. The festival’s two areas hosted six different and inspirational discussions. There were talks of Russia’s current affairs, of expectations to ETV’s new Russian-language TV-channel, of social responsibility and of Russian schools in Estonia. The speakers included both prominent culture and opinion leaders but also local activists and townsfolk. The closing session was titled “Searching for Estonia’s future story”, where people were contemplating about what they value in Estonia and what should Estonia of the future stand for. “The atmosphere at all discussions was very cooperative and the participants were willing to listen to each other and be creative with solutions. It was quite clear that the people in Eastern Virumaa care about the future of Estonia,” said Marten Lauri, who is the initiator of the gathering of future stories. The program of the pre-festival in Narva was collaborated between the people in Eastern Virumaa, the festival’s organisers and the Open Estonia Foundation. The Festival of Opinion Culture will be held in Paide on August 14th and 15th. This year’s brainstorming event produced 250 ideas that will be divided between 30 different areas at the festival. Topics related to security and values will be given their own areas. The festival is organised by a number of different organisations and people from across Estonia.